Haarlem, The Netherlands (21 February 2013): DISC Archiving Systems B.V. (“DISC”), market leader in professional data archiving, is pleased to announce that DISC has joined the Optical Archive Group (“OPARG”). The Optica l Archive Group promotes the benefits of optical archiving (BD/BDXL/DVD/CD Technology) and encourages the widespread adoption by proposing professional solutions for long-term storage systems. 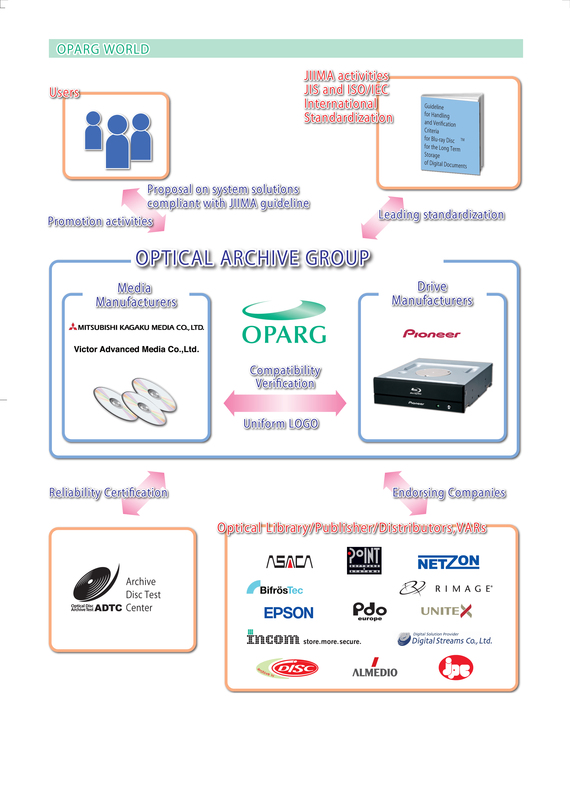 The Optical Archive Group was formed in 2012 by Mitsubishi Kagaku Media Co. Ltd. (Verbatim), Pioneer Corporation and Victor Advanced Media Co., Ltd. (JVC) with the objective to establish a professional association formed by optical archiving specialists worldwide. OPARG´s ultimate goal is to facilitate international standards for long-term optical archiving, ensuring the quality, scalability and reliability of archiving with optical technology as well as raising compatibility by achieving advanced quality management for optical discs and drives. “The OPARG Group is very pleased with the support of DISC Archiving Systems”, states Hideharu Takeshima, Archive Project Leader of Mitsubishi Kagaku Media. "DISC has a long history in providing state-of-the-art optical library solutions and is a valuable addition to our consortium where we all strive to provide the highest quality optical archiving solutions". “DISC actively supports OPARG´s mission and is delighted to collaborate to raise the awareness for optical archive solutions for long-term professional archive storage”, states Kees Machielsen, CEO of DISC Archiving Systems. “In many situations we receive feedback from our integration partners and customers that they have invested initially in Hard Disk and/or LTO based solutions which need technology refreshes and data migrations every 3-5 years, resulting in expensive short-term solutions for their valuable corporate data”. “Blu-ray optical technology fulfills a number of customer requirements (longevity, compliance, backward compatibility etc.) as part of its standard features and provides a sustainable long-term solution whereby the customer can truly “file and forget”. DISC Archiving Systems, Inc. (DISC) is a leading manufacturer of optical storage solutions for the long-term retention of digital data. DISC has been providing innovative solutions for over 20 years and thousands of installations worldwide. DISC manufactures a complete line of automated Blu-ray optical archival storage library products with on-line capacities ranging from 1.5TB to 70TB+. Designed to meet rigorous regulatory compliance and long-term archival storage requirements, the DISC Blu-ray optical solutions are a superior green technology component for tiered Archive and Enterprise Content Management (ECM) solutions offering the lowest power and cooling consumption of any comparable storage product for Corporate, Education, Entertainment, Finance, Government, Healthcare, Imaging, Insurance, Pre/Post Audio/Video production, Law Enforcement/Surveillance markets and more. DISC works closely with industry leading middleware storage management software solutions and provides complete integrated turnkey solutions. DISC’s worldwide headquarters is located in Haarlem, The Netherlands, with North-American Sales and Support operations in Denver, Colorado. *The OPARG logo is trademark of Pioneer Corporation.